Or enter your own Bible Verse to the right. 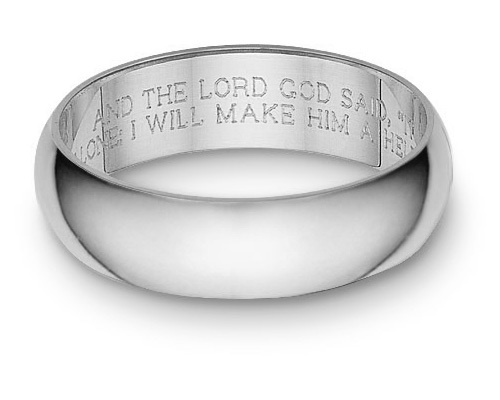 14K White Gold Bible Verse Wedding Band Ring. Customize your ring with Scripture, by choosing from our Scripture listing or adding a Bible Verse of your choosing! Also available in 4mm wide. Custom verses may contain up to 225 characters (including spaces). VERSE 6 - Come out, you daughters of Zion, and look at King Solomon wearing the crown, the crown with which his mother crowned him on the day of his wedding, the day his heart rejoiced. We guarantee our Bible Verse Wedding Band Ring, White Gold to be high quality, authentic jewelry, as described above.